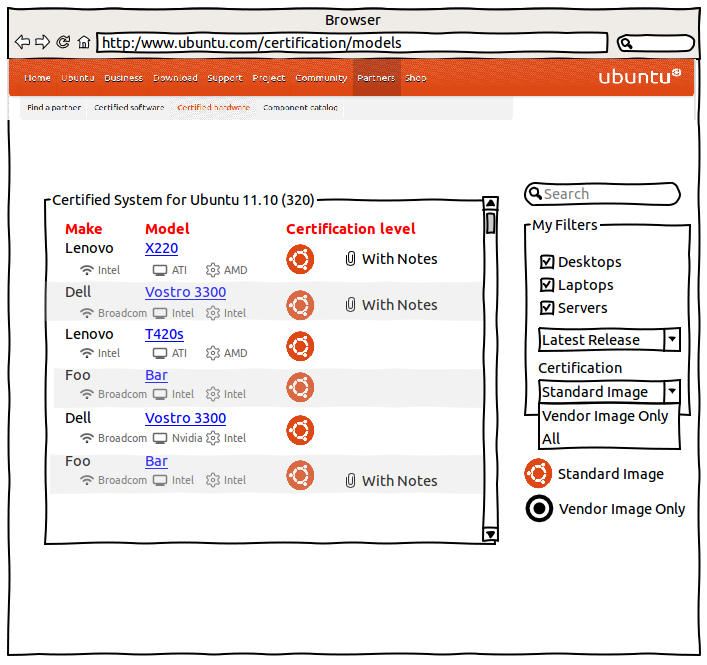 After spending some time last week locked in a room thinking about how to better display hardware information to consumers for Ubuntu Friendly, I started to wonder if we could apply some of the ideas to the certification site. Your website says that my system is certified (pre-install only) but I can not find the “pre-install” image anywhere. I have looked at your website and says my system is certified, but my system does not work with Ubuntu. What components are included in the system that you tested? Only listing one release at the time, defaulting to the latest. This way the user has to select what release they are looking for and only the relevant data is displayed. 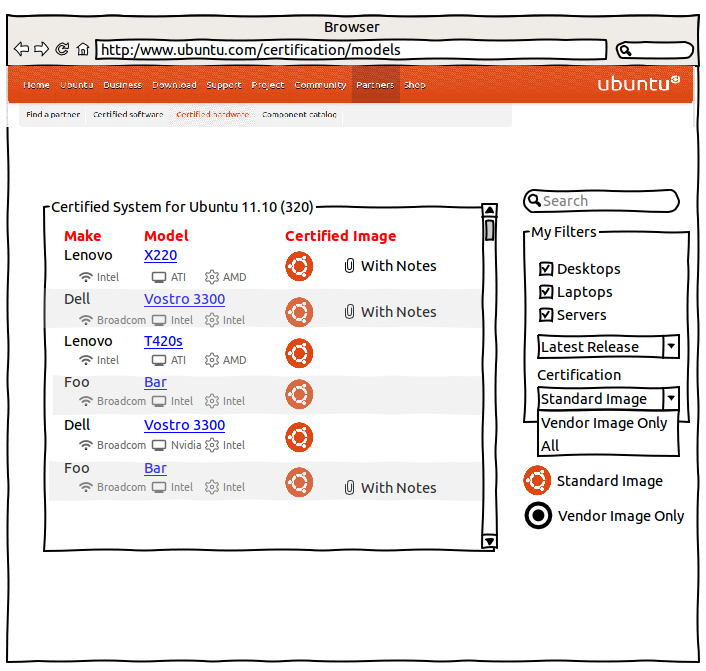 Default to only listing Systems certified with a standard image, giving users the option to choose “Vendor image only” certified systems. Display SKUs rather than Systems as entries on the results list. For example, theVostro 3300 is listed twice in the mock-up. It displays the make of the 3 components that most often differentiate a SKU – Network, Graphics and Chipset. Hovering over the icons would produce a call out with the detail component name. What do you think, will this help? Does this address users concerns? Previous Post How do I benefit from Ubuntu Pre-Install? Next Post Ubuntu Certification – What do we test? One thing I would like is to be able to do is search by component, not just by model name. I have tried to find out whether a video card was compatible with Ubuntu a couple of times and wasn’t able to get a list of the systems that actually had that particular HW. I think this would be very useful. Don’t know if the re-design will solve the problem but I do appreciate an effort to try to make it easier to find OEM certified systems for stock Ubuntu installs. Though one additional minor caveat, the “with notes” is still going to cause confusion for some people looking to do stock DIY installs. Now I know you can’t highlight all the special circumstances that will show up as a system specific note…but maybe you can do something about the most common notes. See if you can’t take catagorize those notes into two or three headings that provide more description. Like for example are +20% of the notes about needing post-install proprietary drivers from the restricted archive? Are 20% about wireless specifically? See if there are some noteworthy issues that bubble up most frequently and see if you can’t work one or two of them into the top level list view to replace “with notes”. And even if you can’t work that information into the re-design due to design constraints I’m not fully cognizant of, reviewing and categorizing the notes might still be useful information to relay somehow. Oh I noticed the little icons for the wireless,video,processor. Maybe you can find a way to use those icons to indicate gotcha notes for each of those important components. If I were a betting man, I’d wager a good chunk of those gotcha notes are for the wireless and video hardware specifically. If you could find a way to reflect that in the wireless/video icon/vendor info that would probably be a win for helping people use the listing more effectively. Can you tell me which software are you usinf for this kind of sketch?